Star Wars: The Last Jedi is now available at home. Star Wars: The Last Jedi is now available for digital download and is coming to Blu-ray on March 27. The release is jam-packed with goodies, many of which cover things we’ve covered on the site already, such as Mark Hamill and Rian Johnson’s different opinions on Luke Skywalker, the Captain Phasma deleted scene, and Johnson’s motivations behind some of the film’s bigger, more controversial moments. But there’s a lot more. We went through all of the features on the disc, which includes a full director’s commentary, 13 deleted scenes, and a feature-length documentary called The Director and the Jedi (which is worth the cost of purchase alone) searching for new, fun, and fascinating information. Here’s what we found. This was one of the first images Rian Johnson had in his head for the film. • Before he even wrote the movie, writer-director Rian Johnson had these very specific ideas in his head: The idea of a casino planet where the one percent of the Star Wars universe lives. Rey in a mirrored space, seeing an infinite number of herself. The red and white environment seen on Crait. And an image of Kylo and Rey back to back, fighting a bunch of guards. • There are lots of things in the movie that are practical that you maybe didn’t realize, including the bombs sliding down from the bombers, Luke exploding the hut when he sees Kylo in it, and every single shot of Yoda. Some of the Fathiers, the horse-like aliens on Canto Bight, were also practical courtesy of animatronic models (but only the stationary ones). • When Johnson sat down to write the script, the first thing he tried to write was an opening crawl, which makes sense. But he didn’t finish it until right before the film’s release, as he continually tweaked it, even long after digital effects and sound were done. • An incredible 120 sets had to be built for The Last Jedi. This was originally the film’s first image after the crawl and a pan down. • The film originally opened in a different way. After the crawl, the camera would pan down to Finn in a medical dome where he’d wake up as he does in the film, screaming for Rey. Then we would have seen the First Order arrive to destroy the Resistance through his eyes. This opening was scripted and actually shot, and parts of it were edited into the final movie, even though Johnson suspected it wasn’t dramatic enough early on. You can see this original opening on the home release. • The sound of Poe’s massive jet engine on his X-Wing was a blend of things, including rolls of duct tape being ripped open, along with the engines of the Lucasfilm Fire Department’s trucks. • Seeing BB-8 doing repairs inside an X-Wing was another of Johnson’s first ideas, because we’d never seen exactly how R2-D2 fixed Luke’s X-Wing in the original trilogy. However, the first gag was just that BB couldn’t reach the panel to fix it, and later the idea of him plugging the holes evolved. • The first shot filmed in the movie was of Paige Tico (Veronica Ngo) popping up and seeing the remote on the Resistance bomber. The first full scene, however, was Finn and Rose explaining their plan to go to Canto Bight to Poe. Lots of thought went into what this sounds like. • Though Finn still has Poe’s jacket when the film appears, originally there was a scene where Poe explained to Finn what happened after he got injured and gave him back the jacket, complete with new stitching done by Poe himself. A man of so many talents. • When Snoke rips into General Hux for losing the Dreadnought, the stuntman who fell down from Snoke’s Force powers broke his nose on the ground. • Earlier digital versions of Snoke were skinnier and frailer, but it was decided he didn’t look intimidating enough. So the effects team gave him broader shoulders and made him six inches taller. • It took the make-up team almost six months just to design Kylo Ren’s scar. • Originally, after Kylo smashed his helmet, it was left in the elevator with a huge crack. That wasn’t enough for Johnson, who personally smashed it with his feet to create the totally obliterated version we see in the movie. “It’s time for the Jedi to end,” said the trailer editors. • Luke’s line, “It’s time for the Jedi to end,” wasn’t originally in the movie. Johnson’s origin version of it was longer, but similar. When cutting the teaser trailer, though, the editors snipped the line down; Johnson liked it so much, he used it in the movie. • The hand that pulls the dice down from the Millennium Falcon mirror belongs to Rian Johnson. It’s his cameo. • The idea of Rose being a fan of Finn’s came late in the writing process and only after Kelly Marie Tran changed Johnson’s perception of the character from mopey to more positive. • Lupita Nyong’o only worked one day on The Last Jedi as Maz Kanata. Earlier versions of the film had her hanging with the Resistance, but got cut. Canto Bight was a production nightmare. • Creature designer Neal Scanlan said that The Last Jedi has more special effects work in it than The Force Awakens and Rogue One combined. Much of it ended up on the cutting room floor, but you can see some of it on the home release. • Much of the “multiple Reys” effect inside the mirror cave was captured practically by a unique array of cameras, all filming Daisy Ridley’s performance simultaneously from different positions. • In editing, Johnson almost cut out the lingering shot of the baby porgs in the Millennium Falcon many times. But every time she saw it, Lucasfilm president Kathleen Kennedy laughed, so it stayed in. • Beyond his performance, Frank Oz helped a lot with the Yoda scenes. The reveal shot behind Yoda was his idea and, later, he went into the editing room to give Johnson ideas on how to edit a puppet scene and make it more dramatic. • Among the coins that DJ steals on the ship is a Zorkmid coin from Rian Johnson’s personal collection. It’s a coin linked to an older computer game called Zork by Info Com that’s he’s had since he was younger. 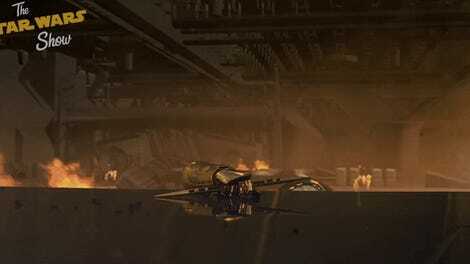 • The home release has the extended version of the “Mega Destroyer Incursion” by Finn, Rose, and DJ. It includes a lot more tension, more humor, a visual homage to the classic ‘50s romantic dramedy The Apartment, and even a cameo by Ralph Ineson (The Witch) as a First Order officer who’s onto their games. Although no one and nothing in the extras confirms it, we’re pretty sure a Stormtrooper that talks to Finn in the extended scene is played by Tom Hardy, as has been rumored. • There was a lot of discussion of what Captain Phasma’s exposed eye would look like when Finn breaks her helmet. Johnson credits Daisy Ridley for telling him to just make it normal. 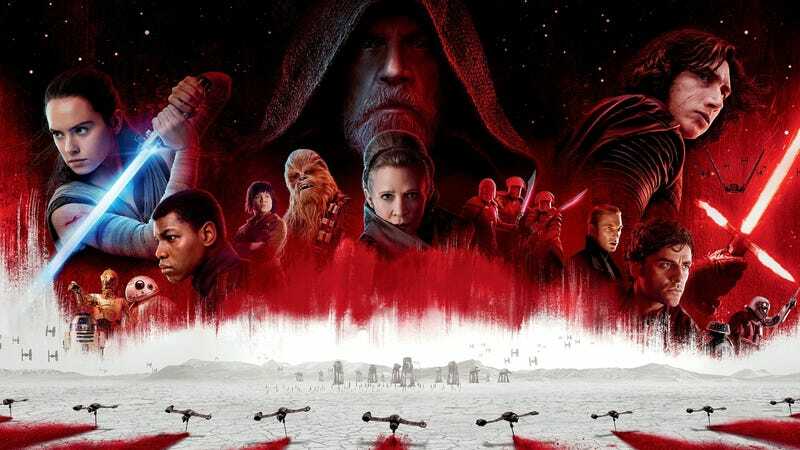 • The red dust on Crait was made from shredded paper which was dyed red. It was one of the hardest things for the crew to get right. Yes, that’s a lion you hear. • The gorilla walkers on Crait (the AT-M6s) got their sound from a metal press as well as the groan of an actual lion. • In the original version of the Crait Falcon chase, Johnson imagined a giant crystal monster that would attack the ship from underground, but it was cut well before filming. • While writing, Johnson considered having Luke use the Force for some massive attack at the end, but felt it went against his idea that the Force is not a superpower. • The binoculars Poe uses to look at Luke and Kylo are made from an old Super 8 camera. They really tried to make this for real. • Despite many attempts to make them practical, from animatronics to dressing up dogs, Crait’s crystal foxes are all digital. Digitally, though, each one has 25,000 strands of CG hair coming off it. • Kylo Ren entering the cave on Crait was filmed specifically to look like a similar overhead shot in Revenge of the Sith. • Johnson recorded his director’s commentary before the movie was released, so he never addresses some of the more “controversial issues.” However, even then he already had an idea they would be polarizing. These are some 0f the secrets from the film’s extras, but by no means all of them. You can see them yourself on Star Wars: The Last Jedi’s digital download, which is available now. The film will be released on Blu-ray on March 27.